Students at CAP enjoy visits from Elroy. Elroy is a rock star! That’s the general consensus when the 15-pound, 6-year-old friendly ball of fur romps into Cathedral Academy at Pompei with Carol Crist to join the students for some playful cuddles and friendly licks. Crist, wife of Catholic Schools Superintendent William Crist, has been bringing Elroy, a Shih Tzu, to CAP once or twice a month since last year. She and Elroy are part of Pet Partners, an organization that brings pets into local schools, nursing home and hospitals to promote the animal-human bond. According to Crist, many of the children at CAP don’t have dogs at home or, as former refugees, are from places where dogs often run wild and are undomesticated. Some of the children are fearful or have had little exposure to dogs, but Elroy easily charms even the most hesitant with his relaxed temperament and exuberant demeanor. Both CAP Principal Sr. Helen Anne Charlebois and faculty member Janet Driscoll thought bringing in an animal to the school would benefit the child-ren, both for the psychological benefits and just to have some fun. Elroy and Crist are both certified through Pet Partners, which offers special training to make sure all dogs have the correct temperament and can obey basic commands. Crist and Elroy visit other schools during the year, too, and have even been spotted on the Le Moyne College campus during finals week to help relax stressed out students. The Crist family adopted Elroy six years ago. Their son, Billy, now a college student, wanted a black Shih Tzu puppy, and when they arrived at the breeder there were many to choose from. Then there was Elroy. He was young, but not the brand new puppy they expected to find. He had been the runt of his litter and time and time again been overlooked by potential adopters, but this was his lucky day. “Our son wanted him, and that was that. 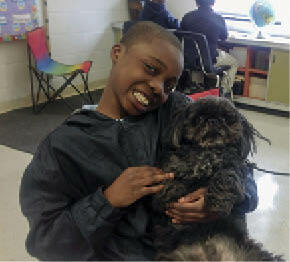 Elroy quickly became an important part of the family,” said Crist, who also has another Shih Tzu at home named Luigi. Over the past year, Elroy has become an important part of the CAP family, too, and Crist looks forward to more visits later in the school year.